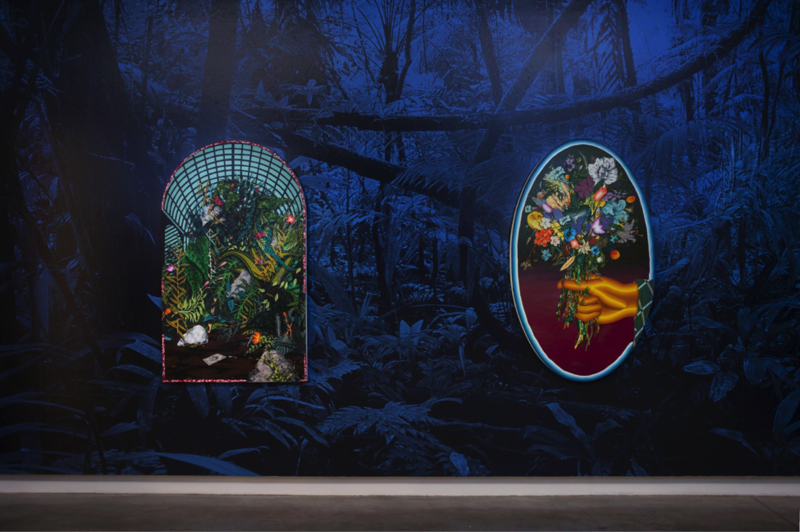 Amir H. Fallah creates paintings, sculptures, and installations that utilize personal history as an entry point to discuss race, representation, the body, and the memories of cultures and countries left behind. Through this process, the artist’s works employ nuanced and emotive narratives that evoke an inquiry about identity, the immigrant experience, and the history of portraiture. Fallah interrogates systems of representation embedded in the history of Western art. 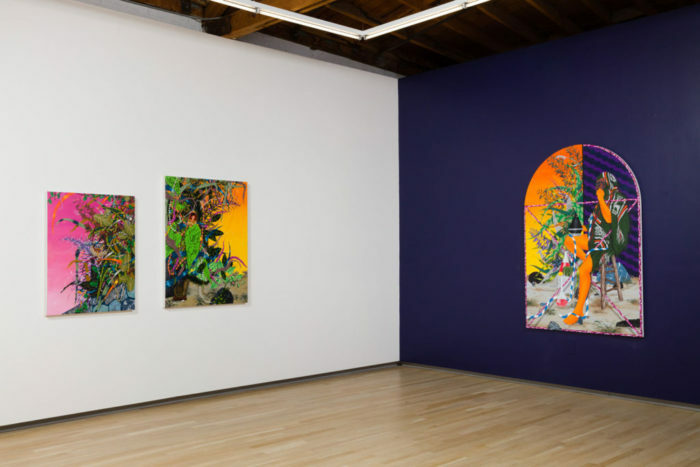 His ornate environments combine visual vocabularies of painting and collage with elements of installation to deconstruct material modes of identity formation. Portraits of veiled subjects capitalize on ambiguity to skillfully weave fact and fiction, while questioning how to create a portrait without representing the physicality of the sitter. While the stories that surround his subjects are deeply personal and are told through the intimate possessions they hold most dear, his work addresses generational immigrant experiences of movement, trauma, and celebration. 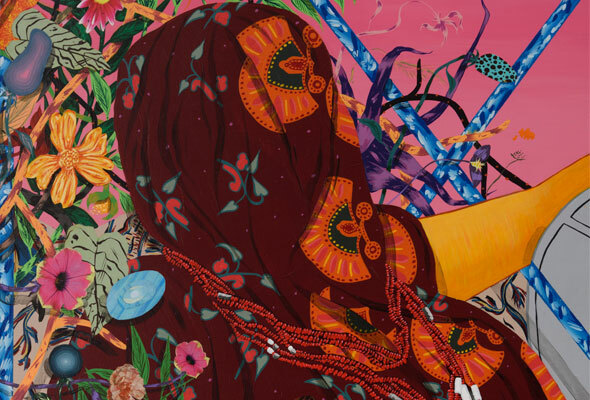 Fallah wryly incorporates Western art historical references into paintings formally rooted in the pattern-based visual language of Islamic Art. In doing so, his paintings possess a hybridity that reflects his own background as an Iranian-American immigrant straddling cultures. Fallah received his BFA in Fine Art & Painting at the Maryland Institute College of Art and his MFA in painting at the University of California, Los Angeles. He has exhibited extensively in solo and group exhibitions across the United States and abroad. 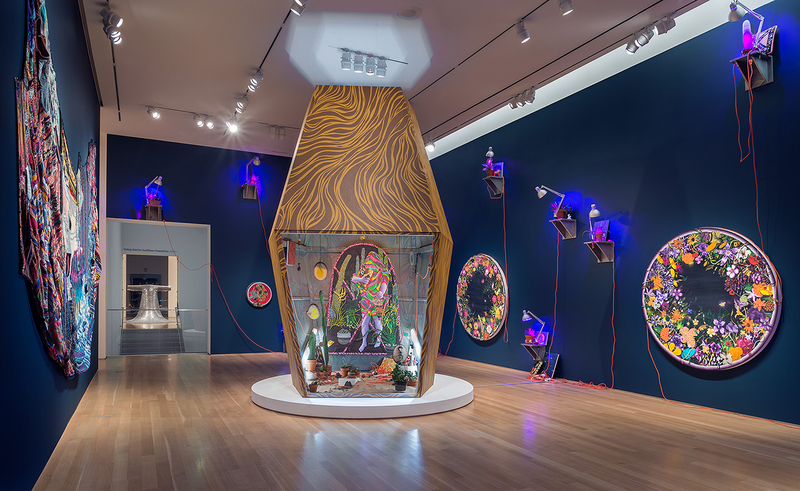 In 2015, Fallah had a solo exhibition at the Nerman Museum of Contemporary Art and received the Joan Mitchell Foundation Painters and Sculptors Grant. In 2009, the artist was chosen to participate in the 9th Sharjah Biennial. Fallah’s painting Calling On The Past received the 2018 Northern Trust Purchase Prize at EXPO Chicago and is now part of the permanent collection at the SMART Museum of Art at the University of Chicago. The artist is also in the permanent collection of the Neuman Museum, Kansas City, The Microsoft Collection, Plattsburg State Art Museum, Plattsburgh, NY, Cerritos College Public Art Collection, Norwalk, CA and Salsali Private Museum, Dubai, UAE. The artist has a forthcoming solo exhibition at the Museum of Contemporary Art, Tucson in 2020. 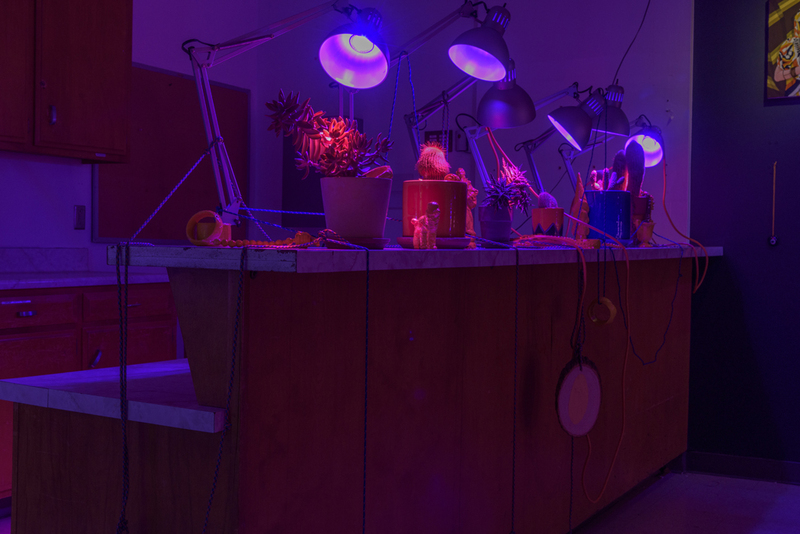 Offering a group presentation of diverse works by Abbas Akhavan, Amir H Fallah, Hayv Kahraman, Laleh Khorramian and Sara Naim, the display will be investigating the concept of space and environment. Each artist interprets their surroundings or habitat, expressing their cognitive or affective "self", be that in a social, physical or mystical sense. 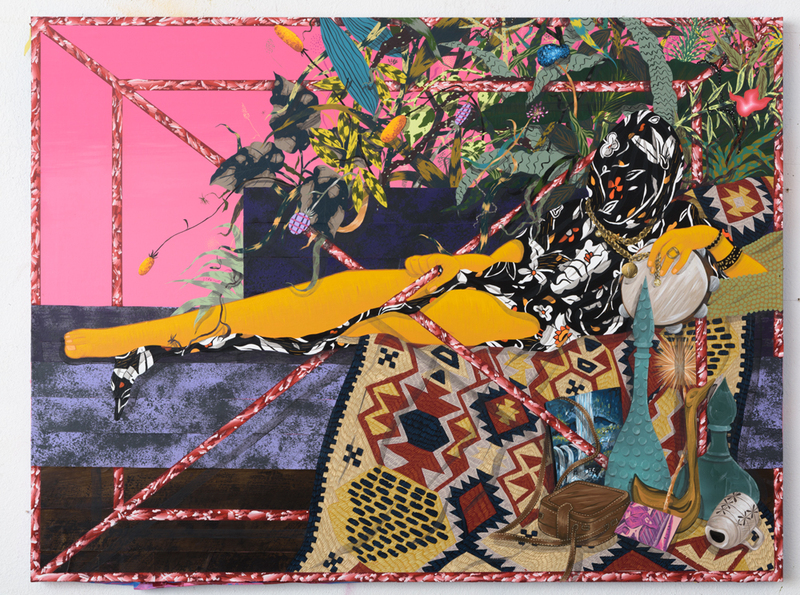 "In Bloom 4" by Amir H. Fallah and bouquet by Debeaulieu are featured in "Sans Titre (2016)," a group exhibition curated by Marie Madec, Paris. On view until April 3rd, 2016, at 45, quai de la Tournelle, Paris. Who? 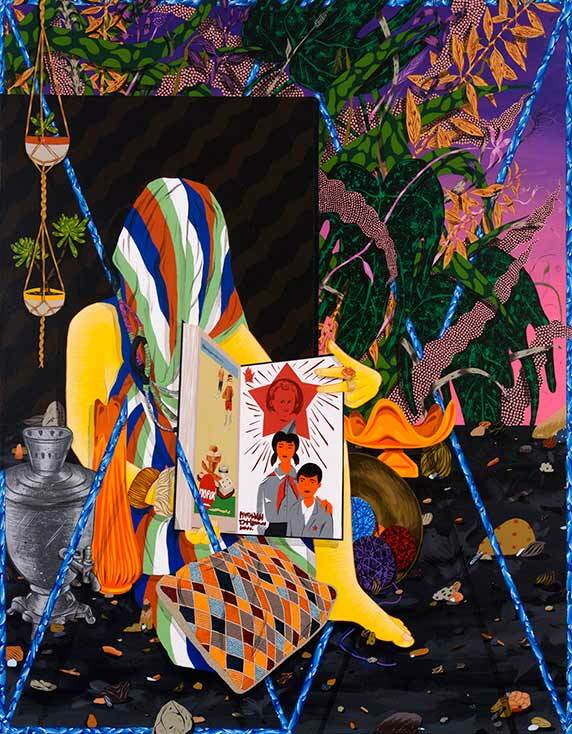 Amir H. Fallah What does he do? The Tehran-born artist links paintings, drawings, sculptures, installations and collages in a development of complex motifs. His works are used for the study of deconstruction, mainly his portraits that encourage self-reflection on identity. He has exhibited in the USA and in the Middle East. There’s perhaps no truer channel into the soul than figurative painting, a form that taps into all of the emotions and even grotesqueness of the human condition. Here’s a chance to check out some cutting edge takes on what it means to paint the human form, all in the very small porch gallery. A Johnson County journalism professor is obsessed with cacti. 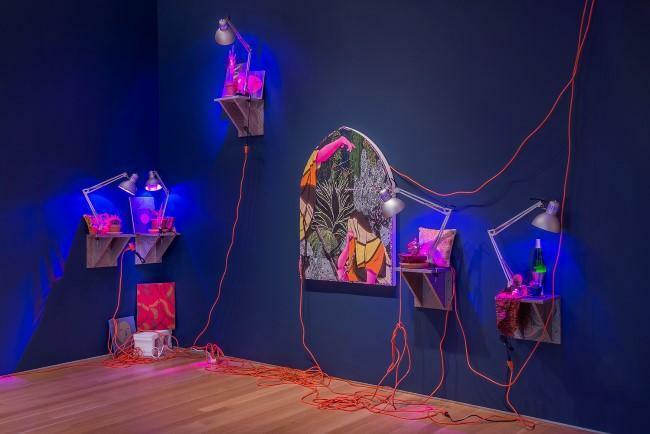 And a Los Angeles-based artist is obsessed with the journalism professor's obsession with cacti. How did this happen? 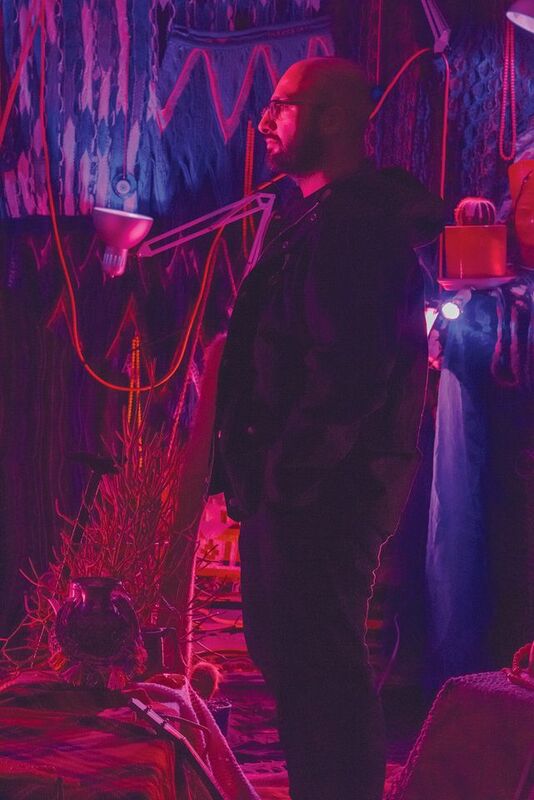 Hear more from Amir on how family inspires his work and entrepreneurial spirit, how he turned Beautiful/Decay from a zine into a fully fledged business, focusing 100% on his art career, finding galleries as long-term partners, building your own buzz, and staying curious.